Home/Blog/Dog Excercise, Dog Toys, Tips/Sean’s Top 3 “Go To” Dog Toys! I’ve had tons of emails asking what I personally do to entertain my canine friends, and what are the best dog toys for 2016. Well, here’s my top three “go to” dog toys. It’s not novel but it’s really effective at getting fetchers more exercise and it prevents me from having to go to the physical therapist with shoulder issues! For those of you who haven’t seen this little piece of equipment, it’s a pretty cleverly designed ball thrower. 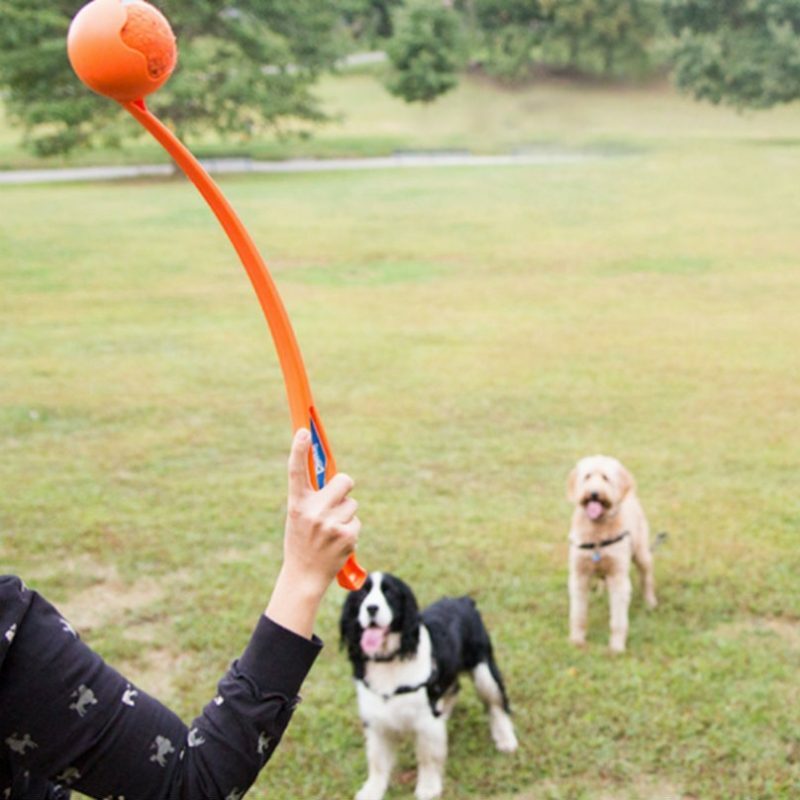 Your Dog gets more exercise: Because of the added leverage the plastic arm gives you it allows you to throw a tennis ball way further than you can with your bare hands which gets our dog a ton more exercise in one session of fetch. It saves your arm: it allows you to throw the ball with less force needed from you (no more sore arms after a long fetch session). No more grabbing gooey tennis balls: Because of the clever ball gripper at the end of the arm, you never have to grab another super slobbery tennis ball. Prevent the challenge of a dog that doesn’t drop the ball: I like to bring 3 tennis balls: I use 2 of them to play with. A dog brings ball #1 back, and I say “drop it”. I only throw ball #2 when they drop ball #1. It doesn’t take long for them to figure out the reward for “dropping it” is that another ball immediately gets launched. Ball # 3 is just a replacement ball, in case of an errant throw over a fence or deep into black berry patches. Get the right size: Smaller yards may only require the shorter version of the chuck it. The classic or longer version will fling a tennis ball 30 to 70 yards (depending on your arm strength) and will send a ball well out of the average back yard. Again, not the newest of inventions in the dog world, but if you’re new to owning a dog or you haven’t got a classic rubber Kong yet, I highly recommend getting one. Durability: I can’t tell you how many dog toys I’ve thought were really good for about a day and half, only to find them in small pieces soon after letting a dog have at them for a little while. The Kong is “almost” indestructible. By almost, I mean I’ve seen one Anatolian, and one Rottweiler go through a Kong but it’s pretty rare. I’ve had some Kong toys longer than some dogs?! The opening is the right size to keep your dog busy for a while: A Kong allows you to put some form of paste (peanut butter, Kong spray treat, or whatever homemade paste you concoct in your blender for your dogs). This allows from about 20 minutes to, sometimes a couple of hours of delicious entertainment for dogs. Pretty easy to clean: (unlike some food toys in which the access holes are too small) Some people do put them in the dishwasher but I’ve found the heated water in a dishwasher and sometimes the heat dry settings, does break the rubber down faster. I use moderately hot water, dish soap to soak for 10 minutes and then use a medium bottle brush to scrub the inside and outside. Prevent a dog from going through the treat filler too quickly: Be sure to stuff the paste far enough into the Kong, so your dog has to really work to get to all of it with their tongue. Get the right size for your dog: They come in small through double XL. I toy that’s too small can be hard for a large dog to get treats out of and one that’s much too large will be unwieldy for smaller dogs. For really powerful chewers: get the black kind instead of the red kind. While the red rubber Kong is plenty strong for the average dog, the black rubber Kong toys are even stronger. Though the black rubber toys are minutely more expensive, they will last longer powerful chewers. This food dispensing toy is made of ‘Kong like’ rubber and makes eating part of a dog’s meal much more interesting for them. Durability: I’ve tested a lot of food dispensing toys that have hard plastic pieces that crack and break easily. This one is much more durable than most dispensing toys. Great Brain work: giving your dog part of their meal each day in one of these gives your dog something to do for their food. That’s much more interesting than just gobbling out of a bowl. Adjustable difficulty: One of the big challenges with most food dispensing toys is that you can’t adjust the difficulty level for your dog. This one is easily adjustable – easy for dogs that are new these types of toys and harder for veterans of the food puzzles. Easily washable: This toy easily unscrews to allow thorough washing and refilling with food. Start your dog easy: Make the space more open the first couple of times your dog plays with this toy. Then gradually tighten the toy together to minimize the space where the food comes out as they get more adept at getting the food out. Get the right size for your dog: Like the Kong toys, these come in different sizes get the size that works for your dog. Give your dog some space to work on this: Some dogs really move around with this toy. If your dog is more animated with toys, you may want to let them have a large area in the garage or on the patio to play around with getting the food out of this toy. Let me know how these toys workout for your dog.